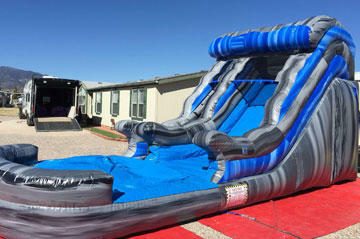 Welcome to High Jump Party Rentals! 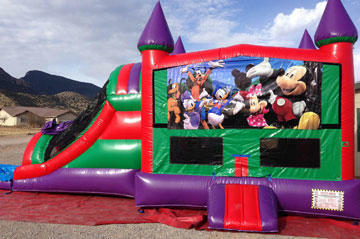 Thanks for visiting Hugh Jump Party Rentals, Sierra Vista's leading bounce house and party rental company! Here you'll find a great selection of bouncers & moonwalks, combo bounce & slides, obstacle courses, water slides and much more. High Jump Party Rentals is dedicated to providing you first rate customer service, quality & value, and integrity you can count on. You can rest assured that safety is number one, and every unit is cleaned and sanitized after every use. High Jumps proudly serves the entire greater Sierra Vista area with delivery service to communities like South Tucson, Wilcox, Huachuca City, Hereford, Benson, Bisbee, Douglas, St. David, and Sonoita. Our mission at High Jump is to provide the best quality service, great value, safe and clean units to make your experience a wonderful one helping you create great memories. 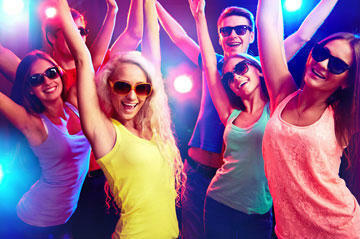 For party rental delivery info visit Delivery Areas. Just click the "Add To Cart" button on every product page and you can enter the date and time of your event and see if the rental you want is available. 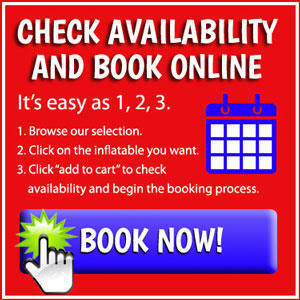 You can also click the "Online Reservations" button at the top right of every page and enter the date and time of your event, then as you browse the site you'll see only those rental items available on your selected date and time. Just click the "More Info" on any of the category pages, and you be taken to that item's product page where you get pricing and more detailed information. To save time and a phone call to get answers to more Frequently Asked Questions visit our FAQs page for more answers. 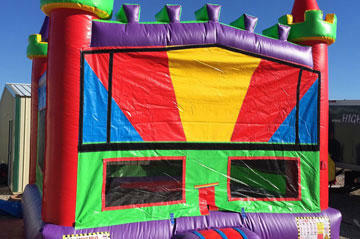 High Jump Party rentals has been providing the greater Sierra Vista Arizona area with best in Bounce House rentals for years. Here you'll find the most exciting bouncers around! Combo Bouncers offer the best in inflatable excitement. They get their name from the fact that they combine the popular bounce house feature with one or more exciting elements. 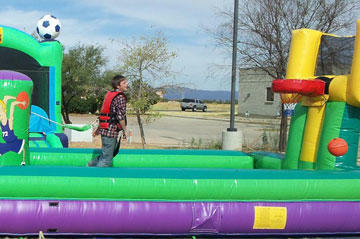 Inflatable Water Slide rentals are incredible attractions when used as the centerpiece of your event. Just the size alone will attract your guests. Get hours of excitement here! 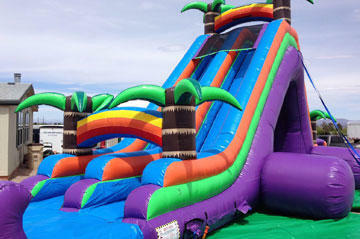 Dry Slide rentals are the perfect choice for when water use is not appropriate. These giant slides are every bit as exciting and fun as their water cousins. Get details now! 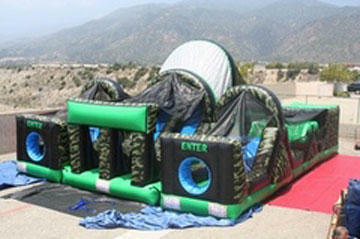 Get your crew together, it's time to take the obstacle course challenge. These awesome challenge courses offer players a chance to test their skills against multiple obstacles. Interactive inflatable game rentals are a great way to add a bit of challenge, skill and interaction between your guests. 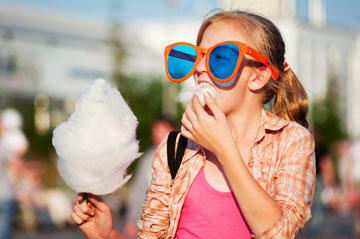 Turn your gathering into a real carnival midway with interactive games. 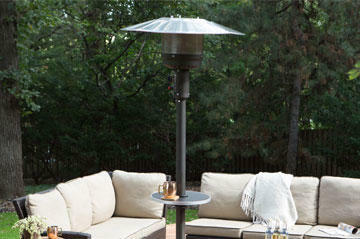 When you're elected to plan the celebration for an outdoor event, your first move is to establish the gathering space. 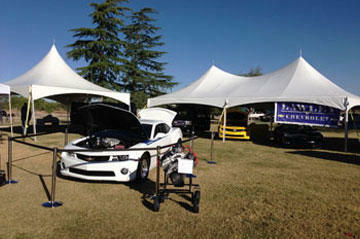 Our tent or canopy rentals make awesome celebrations! 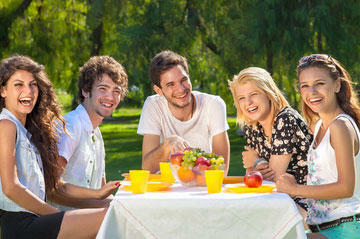 Our table & chair rentals are a great way to provide a seat at the table for all your guests. Maybe you just need some extra serving space. 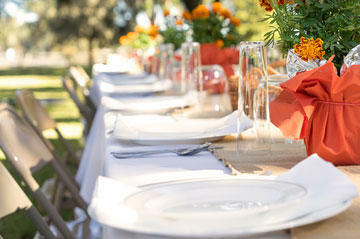 Our table and chair rentals will do the job. Whether your celebration is hot or cold HiJump.net has a great selection Port-A-Cool evaporator coolers and propane fueled patio heaters. Turn up the heat now! Concession equipment rentals are the best way to add an awesome dash of class to any celebration, event or party. All our machines are easy to use! Make your event a little more special with an elegant dance floor. Our stages really raise your event to new heights with adjustable legs. We can add stairs or rails to help make it safer. Whether it's a family celebration, company picnic, or graduation party, HiJump.net can make your place settings stand out atop our elegant table linens. See them all here! 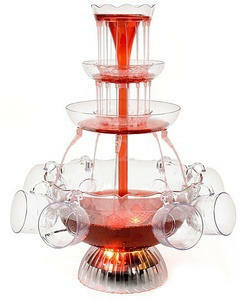 When you are planning an elegant celebration having just the right glassware and other classic items like our champagne fountain our a must. Hi Jump Party Rentals has high quality food prep and service equipment that will meet and exceed for event planning needs.